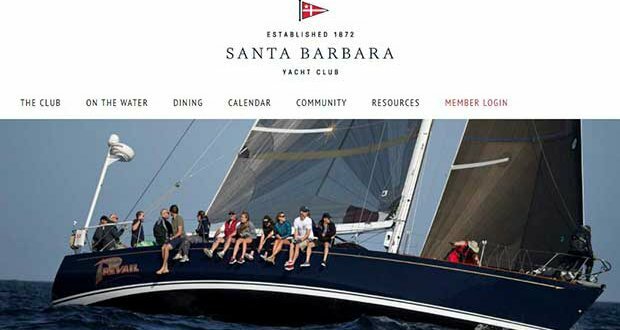 Just before Christmas, the Santa Barbara YC in Santa Barbara, California hosts their annual SBYC Holiday Regatta. The sailors have a wonderful time, often dress up in Christmas themes (like Santa, elves, etc. ), and look forward to an awesome holiday party at the club on Saturday evening. The turn-out for the event this year was higher than previous years with a very competitive J/70 fleet in attendance. The regatta took place on December 2nd and 3rd. Those were happy times. Pat Toole’s 3 Big Dogs crew finally got their “mojo” going and won two races in the four races sailed, but only won by one point! With a winning tally of 1-2-2 after three races, all Scott and Leslie Deardorff’s crew on Cake had to do was sail in the same waters as the “big doggers” and win the regatta. However, that didn’t happen, with the Cake crew “eating crow” instead, posting a 5th in the final race to disappointingly drop to second for the regatta with 10 pts total. Third for the event was Tom Tunberg’s Namaste with a 4-1-3-6 record for 14 pts. The J/70 sailors celebrated the fun weekend of racing and the awards afterwards on the beautiful deck of Santa Barbara YC overlooking the Pacific Ocean sunset. Those celebrations were short-lived. What no one ever anticipated, of course, was that only one day later- December 4th, the so-called “Thomas Fire” would start and end up blazing out of control due to powerful “Santa Ana” winds that blow hot, dry air offshore. The Thomas Fire would end up burning 273,400 acres in Ventura and Santa Barbara counties, causing traffic disruptions, school closures, hazardous air conditions, and power outages. As 2018 started, California firefighters were still fighting the Thomas Fire, the single largest wildfire in California history. Then, this past week, a massive “pineapple express” weather scenario descended upon the region, not a good thing. An enormous Pacific depression swept south from the Aleutian Islands off Alaska, pulling in huge amounts of moisture from as far away as Hawaii (e.g. the pineapple express source), creating a deluge of rain, falling in massive amounts in a few short hours as it hit the coasts. Exacerbating the scenario were the high (up to 4,000 ft) mountain ranges along the Southern California coastline northwest of Los Angeles, the tall peaks creating a “compression” that simply squeezes more rain out of the systems. The net result was that mountainsides de-nuded of any brush or trees from the wildfires simply produced landslides and huge mudslides that swept down valleys and to the ocean, creating walls of mud up to 4 feet high (1.25 meters) racing downhill, crushing anything in its path- houses, fences, trees, cars, boats, bridges, and sadly people, too. Over ten miles of Route 101 highway along the Pacific Coast were closed from Ventura west to the Santa Barbara; some parts of the highway are under 10 feet of mud and debris. Incredibly, Scott and Leslie Deardorff’s J/70 Cake survived one of those massive mudslides, but one of their buildings didn’t, nor did a car, but thankfully their family is OK and so is their main house. The photos here don’t do it justice, nor indicate how frightening it was. According to Scott, “it sounded like a freight train coming down the hill at us”. More information on Santa Barbara Yacht Club’s J/70 fleet can be found here.